There’s a lot going on in “The Revolutionists.” The French Revolution, for example. But feminist playwright Lauren Gunderson has a lot more on her mind. Her 2015 modernist, meta-theatrical historical/comical fantasy concerns four 18th century women who made significant contributions to their country, but may or may not have been remembered. Gunderson is playing with theatrical form here. But for all its cleverness (mostly of the highly self-aware, wink-nudge variety), the play’s message about the importance of women having a voice and telling their story is delivered, alas, with a sledgehammer. From the three plays of hers we’ve seen locally, it’s clear that Gunderson likes to unearth unsung heroines and give them their due. Commendable, for sure, but some of her structural experiments are more successful than others. “Silent Sky,” recently at Lamb’s Players Theatre, was thrilling. 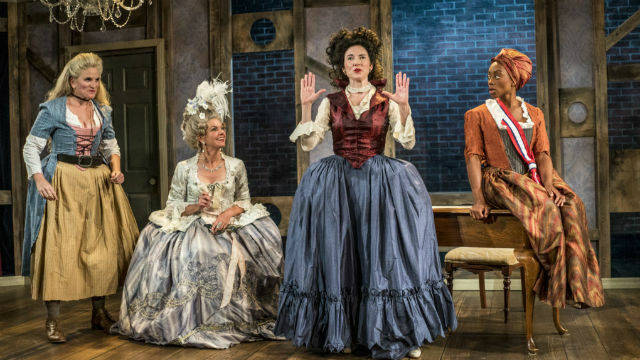 “Emilie: La Marquise du Châtelet Defends Her Life Tonight” (one of the clumsier titles in the theatrical canon), was produced at New Village Arts with, as it happens, the same leading lady — Jo Anne Glover — as “The Revolutionists” at Moxie Theatre. That play, like this one, was too busy making puns and making points to give us fully fleshed-out characters. Here, during the Reign of Terror (1793), we are introduced to the high-voltage foursome in the rooms of playwright Olympe de Gouge, who wrote the world’s first woman’s manifesto. Quill in hand, she’s talking about plays, and playwriting, while she’s actually trying to write a play. (Theater in-jokes abound). Each of her newfound friends (who actually never met) wants to be memorialized in print — or at least given a stunning exit-line. There’s Charlotte Corday (fierce, often-funny Samantha Ginn, also excellent as a masked male Jacobin), murderer of the radical journalist and politician Jean Paul Marat; Marie Antoinette (marvelously droll Lisel Gorell-Getz), the pouty, materialistic, ribbon-hording Queen who voices her own stage directions and just wants to be remembered more fondly; and a composite character, serious-minded Marianne Angelle (Cashae Monya, undeterred by her compatriots’ — or the script’s — frippery), who led the only successful slave rebellion in the Caribbean, in the French colony of Saint Domingue (now Haiti). We come to understand a bit about these forceful females and their terrible times, but their stories aren’t fleshed out enough, and we wish we got to know them better, before they all meet the same metallic fate, courtesy of Madame Guillotine. Each has a deeply compelling story, but as written, they’re all more doctrinaire than multi-dimensional, more caricature than character. At Moxie Theatre, under the direction of Jennifer Eve Thorn, the ensemble is delightful, and their performances are earnest, solid and often amusing (once they stop yelling through the first five minutes of the show). At the end, their deaths are excellently, wrenchingly handled. But the final, “Seussical”-like song is repetitive, non-contributory and superfluous. The set, costumes, wigs, lighting and sound are outstanding — all created by women, probably a first in San Diego — or anywhere. The intentions and commitment of playwright, actors and creative team are unassailable, and the message of women’s individual and collaborative power, as relevant now as ever, comes through loud and clear. Performances are Thursday at 7 p.m., Friday-Saturday at 8 p.m., Sunday at 2 p.m.
Running time: 1 hr. 50 min.